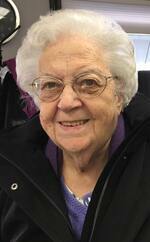 Goshen- Florence E. MacKenzie, 95, passed away Friday Aug. 17th 2018 at home among family. She was married to Enos C. MacKenzie for 62 years. Born in Brooklyn NY, Oct 2nd 1922, daughter of Oscar and May (Blackwell) Elmendorf. Florence MacKenzie received the 22nd highest Honor on June 1945 from John Adams Night School N.Y. that of the "Good Citizen Award". In 1955 she became a Sunday School Teacher at The Bantam Methodist Church Superintendent until the Tornado destroyed the Church in 1989. She became a Veteran of the Cadet Nurse Corp in 2012. The Cadet Nurse Corp was founded in 1943 to Train Nurses to take place of those who went into The Army and Navy Nurse Corp.
She is survived by a daughter Marilyn MacKenzie, two grandsons; Edward and Jason and his wife Heather Zeiner and two great grandchildren; Andrew and Vanessa Zeiner. In Lieu of flowers, memorial contributions may be made to VNA Northwest, 607 Bantam Road, Unit F, Bantam, CT 06750. Family and friends may call on Saturday, August 25, 2018 at Rowe Funeral Home, 283 Torrington Road, Litchfield from 11:00-1:00pm. A service will begin at 1:00pm. Burial will be held at a later date. To send flowers to the family of Florence Elizabeth MacKenzie, please visit our Heartfelt Sympathies Store.